"We have seen many rich persons, many powerful persons, many famous persons, many beautiful persons, many learned and scholarly persons, and persons in the renounced order of life unattached to material possessions. But we have never seen any one person who is unlimitedly and simultaneously wealthy, powerful, famous, beautiful, wise and unattached, like Krsna, in the history of humanity. 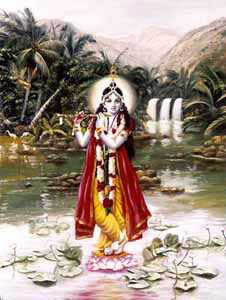 Krsna, the Supreme Personality of Godhead, is an historical person who appeared on this earth 5,000 years ago. He stayed on this earth for 125 years and played exactly like a human being, but His activities were unparalleled. From the very moment of His appearance to the moment of His disappearance, everyone of His activities is unparalleled in the history of the world, and therefore anyone who knows what we mean by Godhead will accept Krsna as the Supreme Personality of Godhead. No one is equal to the Godhead, and no one is greater than Him. That is the import of the familiar saying, 'God is great.'"